A sales close from the past that can be adapted and used to good effect in the present. 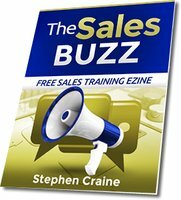 There is closing technique that was used by high pressure closers, it uses linguistic trickery to get prospects to say yes, and it has no place in today's modern professional sales sector. Unless you adapt it that is. Fill in the dots with a benefit the prospect wants, and that you can deliver. When used in the timeshare holiday and vacation sector the seller would wait for a prospect to mention, during conversation, something they would want at a location, for example an apartment near the beach. If the prospect answered yes, and why wouldn't they as that's what they have just said, the seller starts the presentation of a beach location timeshare apartment and uses heavy closing techniques that focus on the prospect saying that was something they wanted. For an even heavier sales close, the seller would call over a closer or a manager who would give the sales presentation. The seller would introduce the prospect and add that Mr and Mrs Whatever want an apartment as long as it has a beach location. This is not quite what the prospect had said, or it certainly isn't what they meant. But if they don't object at this point the closer has a reason to use hard closing techniques, and presumptive sales closing, as the seller said they wanted an apartment as long as the closer could fill their requirement for a beach location. This is old fashioned sales closing using linguistic trickery and high pressure sales techniques. The sales sectors this technique can be used in, in the form shown above, are getting fewer and fewer, which is good for the image of the sales industry. For a more professional approach to a sales close maybe you could adapt the above technique and make it more, well, honest. Taking existing sales training and adapting it for your specific sector can be really effective. I've made a good living from it. What about using the, If I could technique, with an open approach where you tell the prospect that you will ask questions to establish what they want and then, if you can present a sales offer that meets those requirements will they buy from you? The last few words can be changed to adapt the question to the level of closing pressure that you feel appropriate for your buyers. A softer ending might be, if I can present a sales offer that meets those requirements will they consider buying from you? Or you could end the question with, are they in a position to consider moving forward with the proposal?